September 4, 2006 By Michael Hopkin This article courtesy of Nature News. Last orbits for triumphant craft produce memorable photo album. The scientists behind the SMART-1 mission, which ended literally in a blaze of glory at the weekend, have unveiled a series of images taken in the final days of the craft's 3-year voyage. The pictures show a range of lunar features, including peaks of perpetual sunlight regions near the lunar north pole that never see shade, and might therefore make promising sites for solar power generators. The mission team's predictions for the timing and location of the craft's crashdown were almost spot-on, giving them time to instruct SMART-1's cameras to take several valuable shots on the orbits leading up to the crash. The final stages of flight were at a very shallow angle (it crash-landed at a mere 1º to the lunar surface, similar to the angle at which a commercial aircraft lands), giving the cameras pointing forwards and downwards close-up opportunities not known since the Apollo astronauts walked on the Moon. A sequence of images taken on 29 August also snapped the unique view of the Moon passing between the craft and the Earth. Astronomers at the ground-based Canada-France-Hawaii Telescope on Mauna Kea, Hawaii, snapped the moment of impact on Saturday night. Scientists have yet to analyse the pictures for any information they might be able to squeeze out about the dust kicked up by the impact. 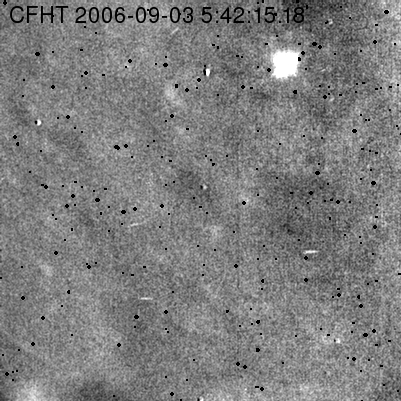 But astronomers have already said that the brightness of the impact was a surprise. It "created a more intense flash than expected", says mission chief Bernard Foing, who watched the impact at the European Space Agency's facility in Darmstadt, Germany. The flash may have been fuelled by the ignition of the handful of hydrazine fuel remaining on board. Although the impact was not expected to be visible without the aid of binoculars or a telescope, one observer has contacted Nature's newsblog to say that they may have spotted it in the partially cloudy sky from a balcony in Honolulu. Mission scientists suspect that, because of the craft's shallow run-in, that it will have bounced rather than buried itself. Planetary scientists now plan to examine the furrow, which will have dredged up previously buried lunar rock, to further examine the composition of the Moon. SMART-1 has a history of geological research. One of its achievements during its 16 months in lunar orbit was to use X-ray images to remotely detect calcium on the Moon an element also common in Earth's crust. Whereas the geology of Moon rock has been studied in samples brought back to Earth, remote mapping of elements on our satellite is something that researchers are still keen to improve on.